When Alohar Mobile launched PlaceMe in 2012 it caused quite a stir, not just because of its innovative ability to use every sensor in a smartphone to track your habits, but also because of the privacy implications of such detailed personal information being shared. Well, Alohar is now ready to share the innermost details of its customers’ lives, but only with a close circle of family and friends. This week Alohar launched PlaceUs in the iTunes App Store. It uses the same core artificial intelligence technology as PlaceMe, drawing from GPS, network ID, accelerometer, compass and even camera sensors in the phone to determine not just where you are, but the context of that location — whether you’re at work, shopping for groceries or picking the kids up from daycare. The difference between PlaceMe and PlaceUs is that PlaceUs is analyzing the activity of a couple, a family or a close circle of friends. It’s not just a family-locator service though, said Sam Liang, Alohar CEO and co-founder. While you can use PlaceUs to do a quick spot check on your spouse or child’s location, it’s intended to provide much richer detail, according to Liang, who worked on the original Google Maps development team. For instance, PlaceUs could determine that you’re shopping for groceries, and not just because your GPS coordinates indicate you’re in a shopping center containing a Whole Foods. From accelerometer and Wi-Fi location data, it knows you’re moving about the aisles, Liang said. 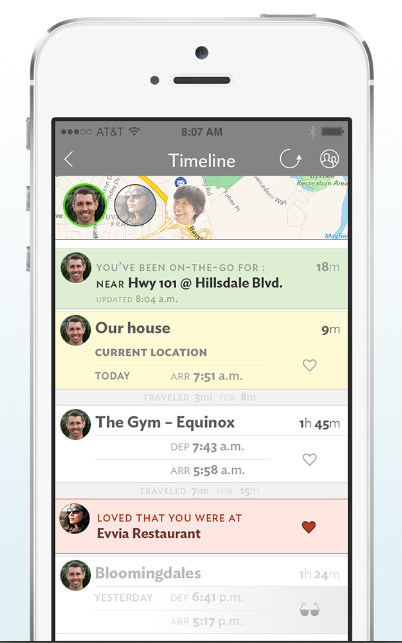 So your spouse doesn’t just see a dot on the map; PlaceMe provides a context. There’s a lot PlaceUs can do with that context, Liang said. It could trigger an alert to your spouse asking if there are any items you need to add to your shopping list. If that Whole Foods happens to be next to your regular pharmacy, PlaceUs could remind you that your kid’s prescription is awaiting pickup. Alohar is still gluing together all the pieces that could trigger these kinds of alerts and actions, many of which would require integration with other apps, devices and data sources. Initially PlaceUs will act as a more precise geofencing tool, alerting family when a member arrives home, at work or any of a hundred different locations. But as PlaceUs collects and refines data about a user’s daily patterns, it will be able to take more complex actions, Liang said. For instance, if you regularly go to the gym on Tuesdays but then stop, PlaceUs could gently prod you to return. If PlaceUs were to access your calendar it could also start recommending convenient times for a workout. As with PlaceMe, the privacy implications of the new app are a bit scary, amplified by the fact that the information PlaceUs is actually intended to be shared with other people. Alohar, however, claims the data it collects is not only secure, but it can’t be seen by anyone outside of your PlaceUs circle. That includes advertisers and marketers, Alohar VP of Products Dave Smiddy told me. Alohar plans to make its money by selling premium app features, not by serving up location-or context-specific ads, Smiddy said. PlaceMe will continue as a separate app, but Liang said Alohar hasn’t decided yet whether it will phase it into PlaceUs. The app is available for the iPhone today, but the company is developing an Android version. Sounds like an interesting service for couples and families. How does one plan a surprise b-day party with an app like this, or is it expected that ppl who use this app never plan surprises for each other? Is your location history stored on your device or on their servers? How much history do they keep on their servers for hackers and government snoops foreign and domestic to see? Is it encrypted, in transit, at rest? “lohar plans to make its money by selling premium app features, not by serving up location-or context-specific ads, Smiddy said.” It is nice that this is their current plan, but is it working? Are they profitable, if they can’t make that model work what then? Come on, I thought these types of questions were standard for reporters in the post Snowden age. Sint these types of tracker apps have a huge impact on battery life?